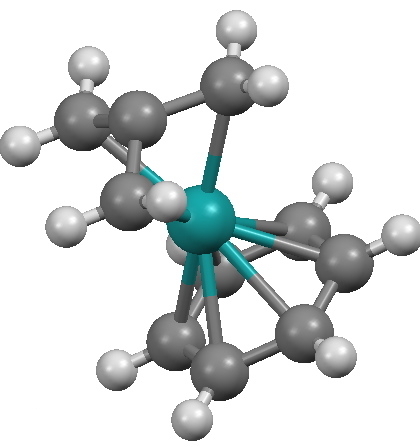 This four-carbon molecule has been known for a long time as a highly reactive intermediate, and as with cyclobutadiene (another 4π-electron species), it can be greatly stabilised (and crystallised) by coordination to a metal. Some twenty examples are known, and one is shown below. Why might it be interesting? Because the trimethylenemethane has four carbons, of which the closest to the metal is the central one (2.03Å). The three outer distances are longer at 2.19Å. If one were to (formally) draw a bond from the metal to the central carbon atom, that atom would become what is known as hemispherical, i.e. all four ligands would be contained in a single hemisphere. This molecule is however normally represented with bonds only to the peripheral carbons, and with no bond to what is after all the shortest of the four distances! A QTAIM analysis gives the same answer. 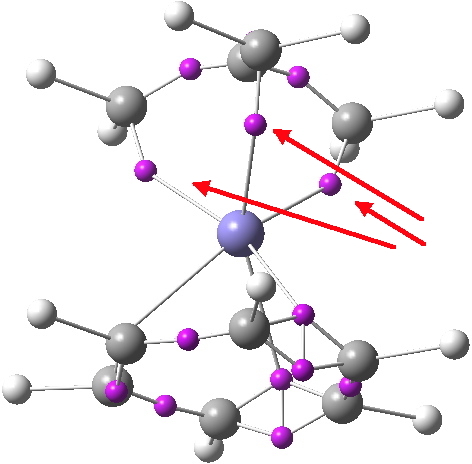 Only three bond-critical points are found in the topology of the electron density (red), and at the centre where one might have expected a Ru-C bond, one finds in fact a cage-critical point (blue). Of course, another way of looking at the molecule is that the trimethylenemethane simply contributes four electrons to the valence shell of the metal without trying to partition these into bonds. These four electrons, together with six from the benzene ligand, complete the 18-electron ruthenium shell. So the take home message is that whilst the concept of discrete two-centre bonds still has its uses, this little molecule reminds us that bonds can be slippery customers. The common practice in most computer codes that represent molecules, of joining up the shortest contacts to form “bonds”, would lead us in this instance to hemispherical carbon. The consensus seems to be that this molecule does not exhibit this. POSTSCRIPT: An ELF analysis of the related Iron complex is shown below. It too shows three disynaptic basins for the three peripheral C-Fe “bonds” (red arrows), and none for the central one. 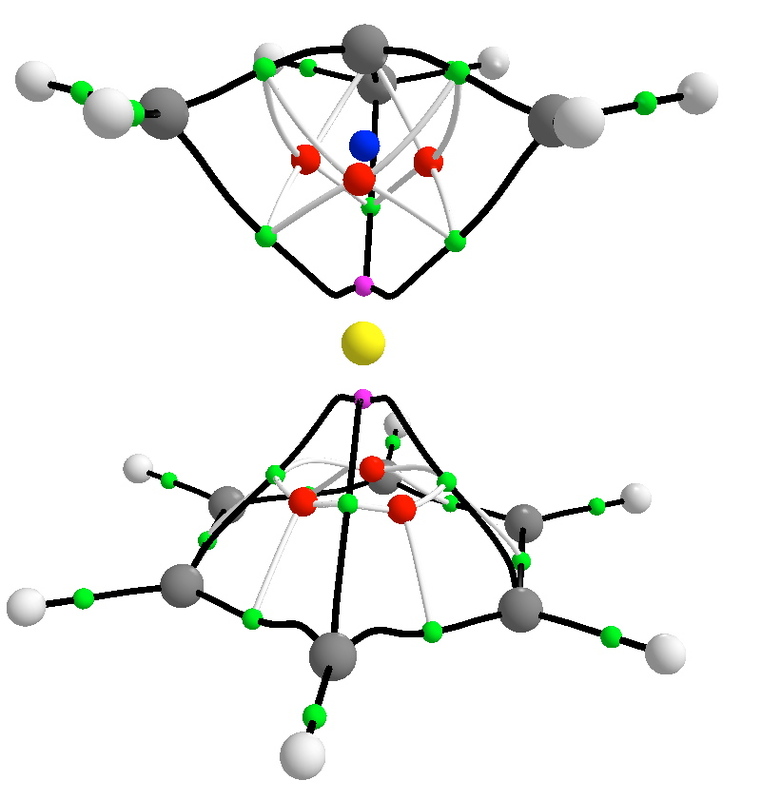 The total basin integration for these three is 4.82e, a bit more than the nominal 4-electron ability of the ligand. This entry was posted on Wednesday, October 17th, 2012 at 4:59 pm and is filed under Interesting chemistry. You can follow any responses to this entry through the RSS 2.0 feed. You can leave a response, or trackback from your own site.